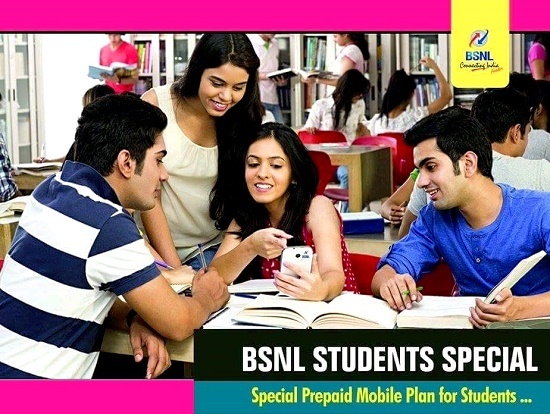 PAN India 3G Service provider Bharat Sanchar Nigam Limited (BSNL) has decided to add more features and special benefits to the recently launched 'Students Special prepaid mobile plan'. As per the latest information, customers enrolled in Students Special plan may enjoy Always Full Talk Time Facility on top up denominations of Rs 500 to Rs 1100, Rs 1500, Rs 2000, Rs 2200, Rs 2500 and Rs 3000. Earlier, this facility was exclusively available for BSNL Per Minute plan customers. However, BSNL will not allow migration to this plan from other existing prepaid mobile plans. It means, customers may subscribe to BSNL's Students Special plan through MNP or New Connections. But migration from 'Student Special plan' to other plans is allowed. 'Student Special Plan' is also applicable in J&K and North East Circles. For J&K and North East circles, the validity of 'Student special Plan' will be 90 days instead of One Year. BSNL Students Special plan will be available for a promotional period of 90 days from 20-06-2016 to 17-09-2016 on PAN India basis. BSNL authorities also informed that, this new plan is available to everyone (plan can be subscribed by normal customers also) who wish to join BSNL network (New Connections or MNP). In the case of Students below the age of 18, a certificate from the school authorities is required in addition to his/her Aadhar Card and passport size photo to get this attractive offer from BSNL. 1GB Free 3G/2G Data available with plan voucher worth Rs 118/- has to be consumed within 30 days of activation. In addition, full talk time for Rs 10/- also will be bundled with the plan voucher for all new/MNP customers. The reduced call charges of 10ps/min ( All India BSNL Network) & 30ps/min (All India Other Network) and reduced SMS charges of 15ps/SMS will be valid for the first 60 days. After 60 days, all calls and SMS will be charged as per Per Minute prepaid mobile plan. To further reduce call charges, customers may also activate other Voice STVs like Voice STV56 / Voice STV 149 / Voice STV159 / Voice STV 201 / Voice STV 359 etc as per their requirement.